Lots of banging during the spin cycle of my LG F1281TD (about 6 years old) resulted in me taking the machine apart to find the reason. I discovered that a cement weight block attached to the front of the drum was being held in place by just one retaining bolt. There were three more that had fallen out at the bottom of the machine. I replaced them and tightened them up pretty well although the thread seemed to have gone on one. Once the machine was back together I put it on a spin, it started off well but then I heard what I assumed to be the loose bolt fall out. I haven't taken it apart again yet but at the end of the spin it was banging again and by rocking the drum I can hear the cement block wobbling and hitting the case again. I suspect the three bolts have come out again and I am assuming that although they seemed pretty tight that perhaps the threads have gone. I'm stuck for ideas on how to fix the cement block in place if the threads on the drum casing have gone. That would mean an new drum section? I'm pretty sure glue and duct tape won't hold. 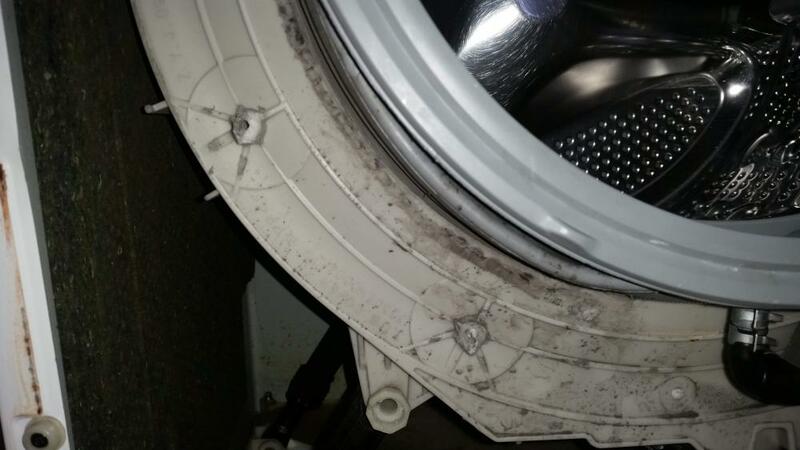 This is a common problem with modern washing machines. Essentially they are trying to fix an extremely heavy concrete block, which swings from side to side under great pressure during spin to a plastic tub. Clearly this is never a good idea. You simply cannot tighten up the bolts tight enough without breaking the plastic. When the concrete block bolts come loose many people ignore them. This usually results in the bolts breaking the plastic fixing they are located in on the main outer drum. Once this happens you would need a complete new outer drum at great expense. If the thread has been damaged on one of them it is essential that you replace it. In fact if any nuts have come loose and been banging the chances are you would need to replace the concrete weight, and all of the nuts and bolts. This is providing none of the fixings where the bolts locate into have been damaged or broken. So to assess the job properly you really need to undo all of the bolts and completely remove the concrete block. If there is no damage to any of the drum and the fixings you might consider a repair. Once the concrete block has become loose you tend to get the concrete wearing away around the bolt. As you can imagine the drum weight moves vigourously from side to side, this results in the hole that the bolt fits through getting worn. The result of this is that even when the drum weight is refitted and the bolt is tightened down the bolts cannot be tightened enough to stop the block moving slightly through centrifugal force combined with the sheer weight. So they often come loose again, or the hole in the drum weight becomes enlarged through the concrete wearing away. This then allows more movement, and more wear, until it starts knocking again. If you don't think the concrete block has worn you could try leaving it. But you definitely need to replace any damaged bolt, and ideally the locking nuts which have obviously failed to hold the weight on tight. A final word of caution. The nuts holding a concrete weight to the drum need to be very tight. There is a lot of force trying to shake it loose. But if you over tighten it, the bolt will be pulled through and sheer through the plastic outer drum fixings. This is why I recommend replacing the nuts. If you have brand-new locking nuts they stand more of a chance of holding firm if you just tighten the bolts down nice and firmly. Alternatively you could try placing some Loctite on the nut and shaft. Exactly how tight to tighten them is something an engineer has to learn, usually through breaking at least one. Personally I use a socket and ratchet set. But when I come to do in the final tightening I stop using the leverage of the handle and tighten it as tight as I can just place in my palm over the top of the socket shaft. It's hard to explain. But essentially it's very difficult to over tighten the bolt if you aren't using leverage. Thanks for the advice Andy. I took another look before I read what you had written. I found that the top two bolts were still in place but the bottom two had fallen out. I did as you mentioned and removed the concrete block completely and discovered that the very bottom hole was completely closed up. Whether it had always been like that I could not say but I'm sure that when I replaced the bolts yesterday that it didn't go into the thread but down the side, that's why I thought the thread had gone when I was tightening it. I suspect that it could have come out of the factory that way. I've now opened up the hole on the drum casing and screwed it in properly. There's a little split to the one plastic hole just above the bottom one but the bolt screws in tight and the concrete block itself seems to be in very good condition. So it's all back together although I have not tested it yet. I was quite conscious about not over tightening as you say. Like you I have used a rachet until the end where I have switched to a screwdriver handle with less leverage for the final tightening. You mention that it may be an idea to replace the bolts themselves? The threads seem just fine on them, they have a washer but there's no locking part on these that I can see. Hello Matt. If the bolts look fine they should be ok. It's just a precaution replacing them all. The main thing is the nuts and the locking device stopping them slowly coming loose and the drum weight not having any wear in the holes. The washing machine has been running sweet since the block was screwed back on. Excellent. Just make sure you keep an ear on it. If it starts knocking again you need to get at it quickly before any damage is done. Many thanks for the update.